Lord Dattatreya was the son of Anasuya and Athri maha muni. He was born on Margasira Suddha (sukla pakhsa) Pournami. 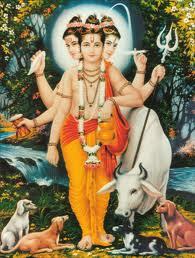 The appearance of Lord Dattatreya is with three heads, six hands, various weapons,with four dogs along with a cow. The three heads represent the trimurthis : Brahma, Vishnu and Maheswara the ones who are responsible for creating the world, functioning the world and destroying the world embodied into single person. The dogs represent the vedas,that have become pets as Dattatreya has knowledge above the vedas. So these are always with him. The cow behind is none but the Maya(illusion) the one that is causing all the troubles in human life. Dattatrey with the power of his yoga converted that Maya to become a humble and domestic cow that would listen to us. The japamala(the chain with rudraksha) in his hands represent all the things related to learning like music, literature, words,sounds etc. The weapon Trishula(the one which at the end gets divided into three spears) represents the Achara(tradition), Vyavahara(functioning) and Dharmardhakama(the thre essentials, Dharma,Ardha,Kama(wishes)). The Chakra (the round weapon) represents the one that can cut through ingnorance and lead to intelligence, darkness to light. The vedas are assumed to be born from the sound of the Dhamuruka(the small drum like thing). The Kamandalam(a vessel that hold water) and the water in the vessel is considered to be of highest purity that can restore us from any kind of sadness or phsical tortutre.